United Nations Secretary-General António Guterres announced on 10 December 2018 the appointment of Carlos Ruiz Massieu of Mexico as his Special Representative for Colombia and Head of the United Nations Verification Mission in Colombia. Carlos Ruiz Massieu brings to this position some 25 years of experience in public service and diplomacy, in both bilateral and multilateral contexts. Most recently, he has been deeply involved in the establishment and support of United Nations peace operations, as well as in reforms to the Organization in the areas of Peace and Security, Development and Management, through his service as Chairperson, at the Under-Secretary-General level, of the General Assembly’s Advisory Committee on Administrative and Budgetary Questions (ACABQ) since 2013, and as a member since 2011. A distinguished career diplomat since 1999, he served as Alternate Representative of Mexico to the United Nations Security Council from 2009 to 2010. From 2004 to 2008, he represented Mexico before the United Nations Economic and Social Council, at governing bodies of United Nations Funds and Programmes, and at the Main Committees of the General Assembly dealing with management and development issues. He also served as Deputy Director General at the Mexican Ministry of Foreign Affairs and was posted at the Embassy of Mexico to Costa Rica. Previously, he held positions in the Ministry of Foreign Affairs, the Ministry of the Interior, and the Ministry of Social Development. Mr. Ruiz Massieu holds a law degree from the Universidad Iberoamericana, Mexico City, and a master’s degree in political science, with a focus on Latin American politics, from the University of Essex, United Kingdom. Mr. Ruiz Massieu is married and has three children. Raúl Rosende is the Chief of Staff of the UN Mission in Colombia and has led the advanced team that that arrived in the country in February 2016. Raúl Rosende has 26 years of experience in coordinating peace initiatives and in monitoring peace agreements, facilitating negotiations between authorities and non-state armed actors, and verifying peace and humanitarian agreements. Throughout his career he has worked for the United Nations and the Organization of American States (OAS). He was UN Humanitarian Coordinator for northern Syria between 2014 and 2016; Director of the Office for the Coordination of Humanitarian Affairs (OCHA), in Damascus, Syria (2013-2014) and in Yemen (2010-2013). 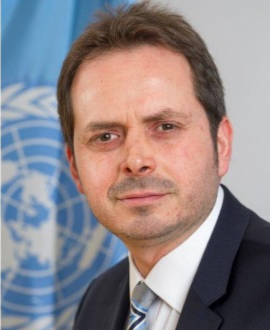 From 2008 to 2010 he was UNDP Peace Adviser in Palestine and from 2008 to 2010 he headed OCHA in Colombia, where he previously had been an advisor to the Resident Coordinator and Programme Coordinator. In previous years, he worked as a Political Adviser in United Nations missions in Afghanistan and Guatemala. He was Programme Coordinator of the OAS in Guatemala (1997-200) and in Nicaragua (1990-1996). He has a Master's degree in International Relations and another in Peacebuilding. Raúl Rosende has two daughters.